San Antonio, TX - SABCS 2004 - Dr. E.S. 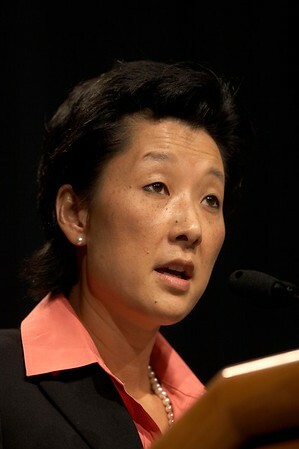 Hwang addresses the General Session 2 at the 27th Annual Charles A. Coltman, Jr. San Antonio Breast Cancer Symposium here today, Wednesday, December 8th, 2004 at the Henry B. Gonzalez Convention Center. Over 6,500 physicians, researchers and care givers from more than 80 countries attended the sessions which featured over 600 presentations on the latest breast cancer clinical trials and diagnostic developments. Credit: Photo courtesy © SABCS/Todd Buchanan 2004. Technical Questions: todd@medmeetingimages.com; Phone: 612-226-5154.